Champa is a fragrant flower derived from India where it is often used in incense and perfume as well as being found in products such as candles and soaps. 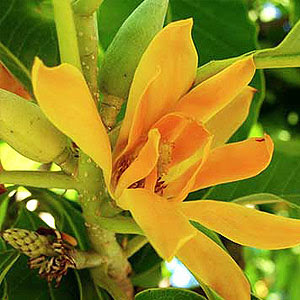 Found growing upon the Magnolia champaca tree, which is said to be so fragrant that it can be smelt several blocks away. It is most often used as a part of Nag Champa, best known for its woody, sweet incense flavour popular throughout the world. The flower itself, Golden Champa, is known as the "flower of paradise" and is famously seen in many films behind an Indian woman's ear where it offers a delightful fragrance. Many people describe it as being a mix between neroli, ylang and tea but with perfect nuances and a scent all of it's own. Champ is easily available as both a hydrosol and an absolute.